TALLINN (Sputnik) - The Estonian military continues searching for a missile that was accidentally fired by a Spanish Eurofighter Typhoon during NATO’s Baltic air-policing mission, spokesman for the Estonian Defense Forces Capt. Aivo Vahemets said on Wednesday. "At least three Robinson helicopters of the Estonian Air Force are participating in the search operation. If it is necessary, policemen and rescuers are ready to join the search. However, it is necessary to determine the search area more accurately. It is too early to form a chain of logistics because we have too little information," Vahemets told the Postimees newspaper. According to the spokesman, the military received several signals from residents of the Tartu region who heard something that sounded like an explosion. This information has been verified. Vahemets also suggested that the missile could have exploded in the air. "Perhaps now we should not look for a whole missile but for its small fragments," Vahemets added. Later Estonian military stated that they found a possible weapon impact point in the Endla Nature Reserve. Estonian Prime Minister Juri Ratas also discussed the incident with NATO Secretary General Jens Stoltenberg. "I told the secretary general of NATO that it is a serious incident and we are understandably concerned about this in Estonia. Thank God that as far as we know, no one was hurt as a result of the incident," Ratas said, as quoted by the Estonian government's press service. According to the press release, Ratas has called on NATO to pay serious attention to the incident and look into all the details surrounding it. "There is no doubt that Estonian authorities contribute to it in every possible way. The Secretary-General confirmed that all allies including those involved in the air policing will do the same. The air policing mission of NATO is an important part of ensuring the security of Estonia and the whole alliance," the prime minister noted. Later in the day, Spanish Defense Minister Margarita Robles Fernandez expressed her regret over the recent incident in Estonian airspace, the Estonian Defense Ministry said. "The Spanish Defence Minister regretted the incident had taken place during the NATO Baltic Air Policing mission," the Estonian ministry said in a statement. According to the statement, both ministers believe that NATO's Baltic Air Policing Mission should be continued as it provides the Baltic states' airspace security. Commenting on the incident, Luik noted that the two sides agreed to closely cooperate on the search of the missile, as well as on the investigation. Estonian Air Force Acting Commander Col. Riivo Valge said that the Baltic country's air force, Spanish authorities and NATO had launched an investigation into the case. 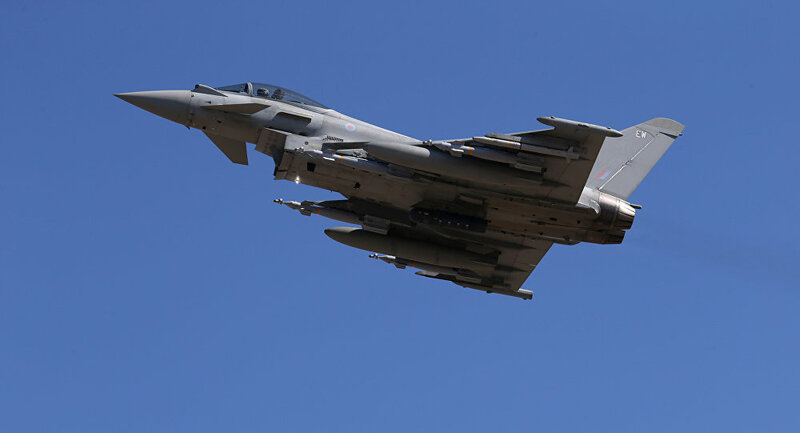 On Tuesday, a Spanish Eurofighter Typhoon 2000 jet accidentally fired an air-to-air missile during its training flight over southern Estonia, the Baltic state’s military said in a statement. Earlier in the day, the defense forces said that the AIM-120 AMRAAM missile had been equipped with a self-destruction mechanism and did not rule out the missile hitting the ground.